I have the same (well, very similar) meter, Andrew - I'll do the test on my 3.0d and post up the numbers here. Has to be. You lose an entire volt for every 0.005 Ω! With a thinner cable I can't imagine how bad. It's a product of having the starter at the other end of the car from the battery! The only other car I've owned that had this same arrangement was an old 1960s Austin Mini. The battery was also in the trunk/boot - because it just wouldn't fit anywhere else!!! Starter current was a lot lower of course... it was only 850cc. You will see almost no voltage until you start to crank. If you see voltage like 0.1v wait until it drops, turn off any power draw like fan. You might see a negative value which will happen when power is coming up the right side cable. So I tried to get a reading tonight - no luck. I thought at least one of my meters had a peak hold voltage setting (or min/max) but they don't, and the start is so fast it was impossible to get any reading. Just performed the simple test of monitoring the voltage drop on the starter cable when cranking the starter. I have a 2001 m54 gas 3.0i. The engine was slightly not cold (a few minutes of operation after sitting overnight then a minute or two rest when I realized I've been meaning to take this measurement for a while). I started the car twice in a row the first was actually about 75/100v second start 63/100 and after waiting just 3-4 minutes took 75/100 again. I'm going on gut to say my starter hasn't started the escalation of current into failure and is pulling between 200-225A. That means 0.75/212.5 means about 3.5 mΩ cable resistance. If you take the voltage drop measured from the cig. lighter socket to the B+ jump point under the hood and multiply by 285 you should arrive at starter current. 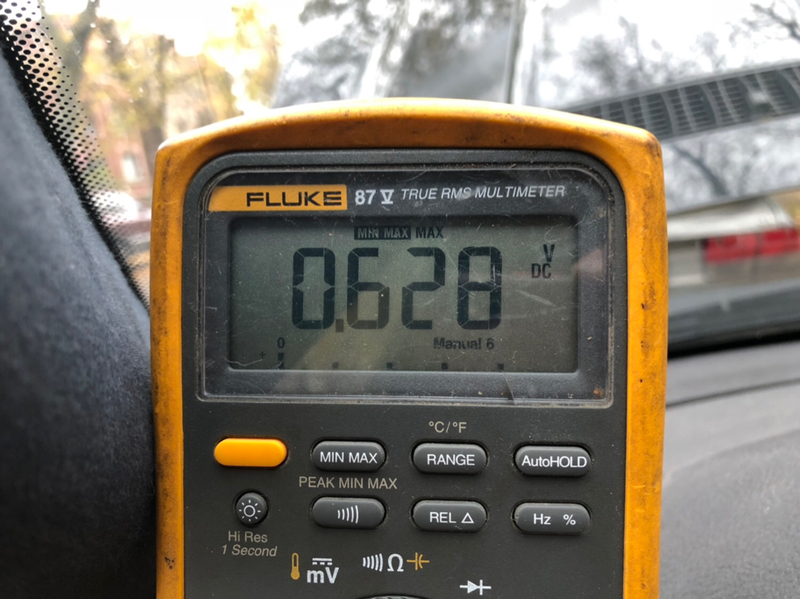 Somebody with access to a clamp ammeter could perform the voltage drop measure to get a more accurate value but this will get you in the ballpark. It also will give you trend and comparison info. Eg. Take the measurement at 30C and 0C it will be a lot different. So back testing: 0.75v x 285 = 285*0.75 = 213. The immediate restart (oil still on all the journal bearings etc) was .63*285 or 180A both numbers seem right on target. I was able to have the shrink wrap on the B+ hold my positive lead to make it very easy to do the measurement. At some point it will be nice to have a control taken to measure the current draw and voltage drop at the same time but the 285 figure will probably work very well for most people to get a sense of if their starter is wearing out. I'll take the measurement on wife's car when I'm in the same zip code as the car to DOUBLE my sample size. Best if your meter has a peak scale (in fact probably a requirement. I just tried to watch live and only saw .30v or something. Maybe with analog meter you can watch the needle. After I get a bigger sample size and especially if I can get a simultaneous clamp ammeter reading I'll make a thread about the topic and post more details. 1.38v would be 392A for comparison. so my maths, lets take the 12.65v as the battery voltage yes? voltage drop of 3.67v X the 285 figure(not sure where you go this from? )= starter draw? in this case it would be 1045.95W (which ahmmm is way over the norm )am i correct in the way I have calculated this? is this even possible to get such a draw? Last edited by omodos; 11-18-2018 at 09:42 AM. Last edited by omodos; 11-18-2018 at 09:37 AM. I think you've misunderstood what you are testing here... you are trying to measure the voltage drop in the main cable due to the starter current. Once you know this voltage drop, you can calculate the starter current draw (using ohms law). To measure this voltage drop, put the black lead from the DVM on the B+ terminal in the engine bay. Put the red lead from the DVM on the centre contact in the cigarette lighter socket in the dash. You should see a voltage very close to zero. Now start the car and note the voltage that appears during cranking. It could be between 0.5 and 1.5v so set your meter to a low voltage range before testing.